I’ve got numerous cookbooks, more DVD’s then I’ll probably ever watch and multiple cushions on my lounge chairs. Each morning I stare at a closet full of clothes and then shut the door thinking, “I’ve got nothing to wear”. In the store I wonder the aisles looking for more stuff to add to my cart, my home and my life. I persuade myself I really need another book/chocolate/bedspread/pot plant/retirement policy. Sometimes I disgust myself with all the things I think I need. I especially find myself repulsive when I drive past the homeless man clutching one grimy blanket over his shoulder. The same homeless man I’ve driven past for the last five years and given nothing too. Really, can I not even spare one pair of shoes for his swollen, wounded feet? Sometimes I think, I should just give it all away, throw out all the cookbooks and scatter cushions and pot plants, and live out that I really believe we only need Jesus to survive. Then I think of the homeless man and I get scared that I will end up like that. And when I get scared, I stop trusting God. I stop believing that the God who clothes the lilies would also clothe me. I stop trusting that if he clothed me, like the lilies, he wouldn’t put me in rags. And then I read Matthew 6 again, and I think about how maybe God doesn’t want me to give it all away, maybe he just wants me not to care so much about all this stuff. Possibly, he wants me to remember that I am not my stuff; I am His. Perhaps he just wants me to be careless in the care of God, whether I have lots of stuff or no stuff, to simply be content to be his and to be looked after by him. We think we need so much stuff. 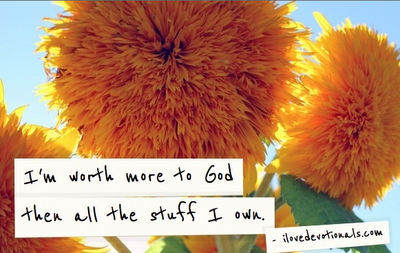 But really all we need is to be content in the care of the only living, breathing God. And in realizing that, we’ll find freedom to live with or without our stuff. How do you think it would feel to trust God to take care of you? Have you signed up to receive new devotionals by email? Sign up by clicking here. If you liked this post, please tweet it or share on Facebook your Facebook page.